What is PDF form flattening? 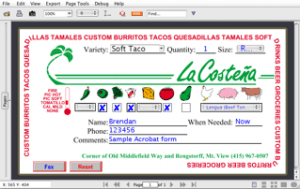 PDF files can include interactive forms – radio buttons, checkboxes, text boxes, lists, etc. There are interactive widgets – the user can click on the and change the values. So you can use PDF files for everything from your tax returns to ordering pizza. The data for forms is stored in a separate area to the text on the page (which coincidentally makes it much easier to edit and extract). Forms flattening is the process of removing this separate form data and adding it as text, images and shapes into the actual PDF data stream. The PDF will still look the same but the user can no longer interact with the forms. 1. It stops the form values being editable and easily changed. 2. It removes the other values on lists and drop down boxes. 3. It simplifies the PDF (and will generally make it faster to render). The one disadvantage is that it makes it much harder to extract or alter the form data – that checkbox is now just a special character on the page. So keep the originals just incase.